The first teaser – a simple image featuring the developer’s logo on a blood-red background – left a lot of room for speculation. 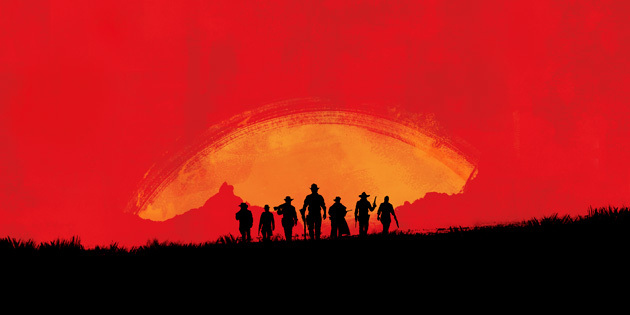 However, the latest one posted on its social channels yesterday, a piece of art depicting seven silhouetted individuals, a number of them wearing hats and armed with guns, appears to be a nod towards a Red Dead sequel. Rockstar isn’t saying much else at the moment, but we’re poking and prodding the company to learn more and will update this post if there’s a response, as best as we can with our crossed fingers. Update: It looks like Rockstar Games’ parent company and distributor Take-Two Interactive registered the domain reddead.online last August. There’s nothing on there yet, though – but hey, it’s something. Update: Rockstar Games officially announced Red Dead Redemption 2 will be released Fall 2017. The trailer hits 11 a.m. ET on Oct. 20. Those hoping for a PC version, best of luck. Erratum: We previously stated that the same studio behind Grand Theft Auto V worked on Red Dead Redemption. While they’re part of the same company, Rockstar Games, those titles were developed by Rockstar North and Rockstar San Diego respectively. We’ve since updated our title to note that Rockstar Games is the publisher behind both games.